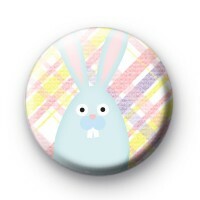 Fun blue buck tooth Easter Bunny Badge. This is a really fun Easter themed badge, the blue bunny is adorable and the colourful background gives it a Spring feeling. Our handmade Spring and Easter badges make fun alternatives to traditional Easter Eggs or would be ideal as a small token gift. We have so many bright, cute and traditional Easter designs in the shop including Easter chicks, Easter slogans and lots of fun Easter bunny badges too. Although not as tasty as a chocolate egg they're still a really fun addition to Easter. All of our badges are 25mm badges and hand made by us in our UK workshop.